However, for some mysterious reasons, some people experienced an unanounced switch of their primary Google account on their phone, making their work or university email the phone’s main account. What does ‘primary account’ actually mean? The primary Google account is used for Google Now card, voice commands as well as all searches done with Google. Especially the fact that all searches go through the main account presents a privacy issue if any personal searches are performed with your work or school email. On top of that, switching accounts may lead to Google Now not working properly. Getting the error “Google Now is turned off for your domain.” indicates that your accounts have been switched. 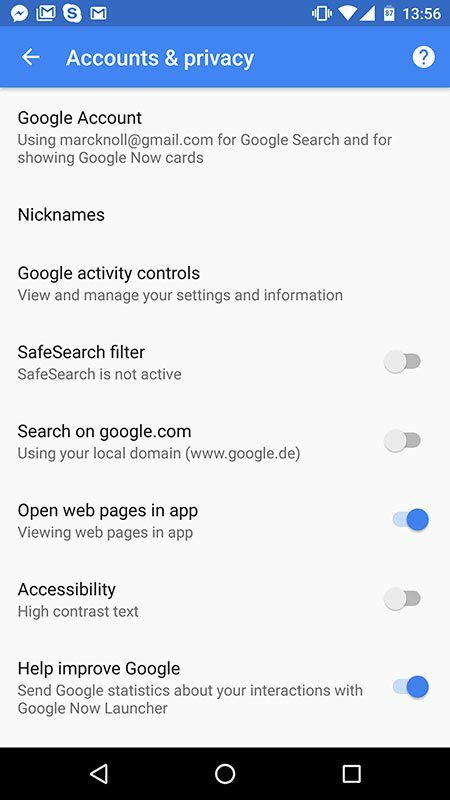 Open your Google settings (either from within your phone’s settings or by opening the Google settings app). Go to Search & Now > Accounts & privacy. That’s it! I hope this short guide was helpful. If you had any issues, feel free to drop a comment.